Can we really say how probable it is that God would design our universe? The design argument has enjoyed a new lease of life in the last few decades, with attention being drawn to cosmic fine-tuning in particular. Scientists have increasingly become aware that the universe is ‘just right’ for life. Had the ratio of the electromagnetic and gravitational forces differed by 1 part in 1040 then planets capable of supporting life could not exist. If the strong nuclear force had been weaker this would have resulted in the instability of the elements necessary for carbon-based life, while if it had been stronger this would have had a negative impact on the production of carbon and oxygen. If the initial explosion of the big bang had differed in strength by as little as 1 part in 1060, the universe would have either quickly collapsed back on itself, or expanded too rapidly for stars to form. This has led some philosophers and scientists to argue that our universe provides strong evidence of a designer[i]. Sober’s reconstruction of design arguments in terms of likelihoods will be outlined; then his central criticism of design arguments will be explained. Sober believes that design has no predictive (or explanatory) power because auxiliary hypotheses about God’s goals and desires cannot be independently warranted. This is because God is too different from human designers. Counter-examples to Sober’s argument will be considered, including two thought experiments which suggest that Sober is mistaken about inferences to non-human (and non-human-like) agents. An auxiliary hypothesis giving some information about God’s goals will be justified using conceptual considerations. However, it will also be argued that such an auxiliary hypothesis is unnecessary because frequency data can be used to warrant inferences about what rational agents would be likely to create – and therefore what God would be likely to create since God is a rational agent. It will finally be argued that Sober has not given us any reason to think that we need detailed knowledge of a designer’s goals to make an inference to a divine designer. Growing out of his response to arguments about intelligent design, Elliott Sober claims to have discovered the “Achilles heel” of design arguments. [vi] Sober’s claim is that we cannot make predictions about a designer’s actions unless we have some knowledge of the designer’s goals and abilities. This needs to be justified with independent evidence. Without independent evidence that gives us insight into God’s goals we cannot predict what God would create. This leaves theism with no predictive power at all. Without any predictive power the hypothesis of theistic design cannot be preferred tothe hypothesis of “chance”. In the simple form of Bayes theorem, p (h|e) = p (h) p(e|h) / p (e). So, the probability of the hypothesis given the evidence is equal to the prior probability of the hypothesis, multiplied by the probability of the evidence given the hypothesis, divided by the prior probability of the hypothesis. The likelihood is p (e|h), the second term in the numerator where p(e|h) is the probability of the evidence or observation given the hypothesis. The idea is that certain hypotheses raise the probability of certain specified observations. If an observation is very surprising on a particular hypothesis, the likelihood will be low. If the observation is expected on the hypothesis the likelihood will be high. Sober does not see Bayes theorem as the best method of inference, because he believes that prior probabilities are too hard to ascertain. Instead, he advocates what is called “likelihoodism” in the philosophical literature: the likelihoods of an observation on competing hypotheses are compared. The hypothesis which makes the observation most likely is the hypothesis with the greatest evidential support; this is the hypothesis which is the one that should be preferred. By way of illustration, Sober uses Paley’s example of the discovery of a watch by a man walking on a heath. Paley argues that even had the man never seen a watch before in his life, he could reasonably infer that the watch was the result of intelligent design. There are features of the watch G1…Gn which are not surprising on the hypothesis that a human designer was involved in the production of the watch. However, these features would be very surprising if this artefact was the result of pure chance. Therefore, the evidence supports the hypothesis of design in comparison to the hypothesis of chance[x]. Similarly, the vertebrate eye has features F1…Fn which enable an organism to successfully navigate in its environment. These features need an explanation and Paley believed that the hypothesis of design was a better explanation than the hypothesis of chance. Sober points out that this argument for design from likelihoods meets two Humean criticisms of the design argument. Things which have 0% of their traits in common do not have a common cause; things which have 100% of their traits in common most certainly have a common cause. So the stronger the similarity between an artefact and an organism, the more probable that the organism is the result of intelligent design. Sober responds that:“This is all true, but entirely irrelevant, if the design argument is a likelihood inference. It doesn’t matter how overall similar watches and organisms are…. Paley’s analogy between watches and organisms is merely heuristic.”[xiii] What matters is how one explains the features of watches which enable them to keep time, and how one explains the features of organisms which allow them to survive and reproduce. It is the predictive power of an hypothesis which matters; or more accurately, the predictive power of an hypothesis when compared to its competitors. Sober notes that “this objection dissolves once we move from the model of inductive sampling to that of likelihood”[xv]. The processes of intelligent design and chance do not need to be observed at work in different worlds to maintain that the two hypotheses confer different probabilities on an observation. Sober believes that a design hypothesis can only be justified if certain observations are more likely on design than they are on some competing hypothesis. Sober also argues that a theistic design should be compared to the hypothesis of “a uniform chance process”[xviii], and indicates that it is important to understand the nature of this “chance” hypothesis to evaluate his overall argument. To say that an observation is the product of “chance” means that it was one of a number of equiprobable outcomes. Sober makes a clear distinction between a “purely random” process and “a partly random partly non-random process.” In Darwin’s theory of natural selection variations are randomly generated, but then traits that help an organism survive and reproduce are non- randomly selected. “Natural Selection is a biased process”[xix] as not all outcomes have exactly the same probability on natural selection. The vertebrate eye evolving in stages from photosensitive cells by a process of natural selection is an example of a partly random, partly non-random process. Contrast this to a purely random process like spinning an unrigged roulette wheel. In this case every outcome has the same probability. A Boeing 747 being formed by a whirlwind passing over a scrapyard is an example of a purely random process. So Sober’s position seems radical: it is his contention that divine design has no more predictive power than a purely “purely random” process, such as galaxies, planets or organisms assembling by a purely random shuffle of particles. In effect, we are in no position to attribute greater likelihood to the hypothesis that God ‘assembled the machine’ than to the hypothesis that a machine would form by chance from a whirlwind. Sober justifies this stance by arguing that divine design has no predictive power because one cannot make predictions about what a supernatural God-like being would create. Sober looks at typical observations that usually feature in design arguments –in particular the vertebrate eye that so impressed Paley. Perhaps the designer would never build the vertebrate eye with features F1 …. Fn, either because he would lack the goals or because he would lack the ability. If so, the likelihood of the design hypothesis is zero. On the other hand, perhaps the designer would want to build the eye with features F1 … Fn and would be entirely competent to bring this plan to fruition. If so, the likelihood of the design hypothesis is unity. …a long chain of steps that begin when light strikes the retina and a photon is absorbed by an organic molecule called 11-cis-retinal, causing it to rearrange itself within picoseconds. This causes a corresponding change to the protein, rhodopsin, which is tightly bound to it, so that it can react with another protein called transducin, which in turn causes a molecule called GDP to be exchanged with a molecule called GTP. Sober’s point is that, prior to the act of creation, there is no way to know that an intelligent designer would wish to create eyes with these specific features. Similarly, it would not be possible to know, prior to the act of creation, that an intelligent designer would prefer universes with constants finely-tuned to make life possible. Unless something is known about the designer’s intentions for his creation, theism has no predictive power. Given theism, there is no way to sensibly estimate the likelihood of vertebrate eyes or finely-tuned constants. Sober’s position is that no hypothesis can be confirmed or disconfirmed in the absence of auxiliary hypotheses. Each auxiliary hypothesis must have some rational support independent of the core hypothesis. Otherwise, theorists could simply attach auxiliary hypotheses to any hypothesis they wished to support; arbitrary auxiliary hypotheses can be manufactured to make the core hypothesis compatible with any observation. So an auxiliary hypothesis justified by independent evidence is needed. Sober’s argument is that the divine design hypothesis lacks all predictive power until independent evidence can be found which justifies auxiliary hypotheses about what a designer would want to do and what he is able to do. Lacking this knowledge our hypothesis has no predictive power and cannot be confirmed by observation. Sober contends that it is impossible to provide any rational support for any auxiliary hypothesis concerning the goals of the theistic God. The divine attributes of omniscience and omnipotence make inferences to a divine designer even more problematic. One way to cast doubt on Sober’s argument would be to offer particular examples of reasonable inferences to a designer in which no knowledge of the designer’s goals or abilities is available. One possible example could be provided by Paley’s story of a man who had never encountered a watch before finding one lying on a heath, and inferring that the watch had been designed. Sober also offers a possible counterexample to his own argument: John Maynard Smith’s story of his job during World War II inspecting a warehouse filled with German war materiel. He and his co-workers often came across machines whose functions were entirely opaque to them. Yet, they had no trouble seeing that these objects were built by an intelligent designer. So at most the man in Paley’s story could infer a human cause for the watch. Sober argues that it is the “signs of human handiwork” that allow an inference to a human designer (from the markings on the watch, presumably), as such artefacts are only correlated with human agents. We could not move from the structure and order present in the watch to a non-human intelligent designer. 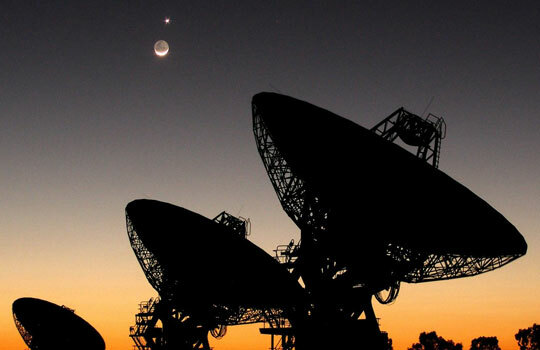 But what about the search for extra-terrestrial intelligence ( the SETI project) ? Scientists have sent messages into deep space in the hope that non-human intelligent extra-terrestrials would figure out that it was produced by intelligent designers on earth. Furthermore, scientists also scan the sky for signs of non-human intelligent life elsewhere. Doesn’t the SETI project presuppose that it is rational to search for evidence of non-human intelligence? Sober thinks not. SETI engineers look for narrow band radio transmissions because humans build machines that produce these signals. Their judgments are made on empirical information about what human designers often do and what they rarely do. It is not unreasonable to use information about what human designers do to make assumptions about extra-terrestrial intelligence, because extra-terrestrials are likely to have evolved by similar evolutionary processes to the processes which produced humans. This may provide useful constraints on conjectures about the sorts of minds they may have. Proponents of the design argument would want to infer a designer from the structure and order present in the observed universe. But in Sober’s view one cannot justify the auxiliary hypothesis that God would include things like vertebrate eyes in his goals. Lacking the necessary data about the goals of non-human (or non-human-like) designers, only predictions about human (or human-like) designers can be made. Suppose an unmanned probe discovers curious items on the surface of Venus, or on the surfaces of Titania and Oberon, two of Uranus’ moons. These items are simple blade-like objects with smoothed edges and what seem to be decorative patterns. Further suppose that each item has the appearance of age, and seems to be made from material that is abundant in that vicinity. The devices also seem to be quite primitive compared to our current technology. So space travellers are unlikely to have left the devices behind. It seems that living beings existed on the planet at some stage and created these artefacts[xxxiii]. If it is confirmed that the location is extremely hostile to complex carbon-based life, human-like creatures as the designers can be ruled out. Natural selection would have had to have taken a radically different course to produce complex intelligent life on Venus or Oberon. Yet it could still inferred that “devices” or “artefacts” had been discovered. So beings similar to humans need not be present to infer design; and knowledge of a designer’s abilities and intentions do not seem to be necessary to infer design. So a frequent correlation of certain artefacts with human activity is not the source of a design inference in this case, despite what Sober says about the Maynard Smith case. Intuitively, it seems likelier that these items would exist given design than by chance. This could be because these artefacts could serve utilitarian, ceremonial or aesthetic purposes. The designer’s exact goals are not clear. One does not need independent evidence of the designer’s nature and goals to infer that design is a likelier explanation than chance. One need merely see some feature of the object that would plausibly give rational agents reason to create that object as an artefact. To consider design likelier than chance strong similarities to human artefacts need not be present either. Imagine this scenario. Sunspots appear as darker features on the photosphere of the Sun, and are regions of slightly lower temperature. Suppose that scientists were to observe a sunspot behaving in a very unusual fashion. The sunspot dips and rises in temperature very rapidly at regular intervals. After a period of observation, an unexpected pattern emerges. The sunspot’s temperature will dip and rise from 4000 to 3000 K twice, then three times, five times, seven, eleven, thirteen, etc. After a period of rest the cycle will begin again, but each time a new prime number is added. It seems very likely that the cause of such an event could involve a designer. Yet it is difficult to see any strong analogy with any event caused by humans. No human technology could manipulate the photosphere of our sun in this way. There is no way of specifying the purpose of making a sunspot dip and rise in temperature in accordance with the set of prime numbers. In other words, there is no way to independently justify auxiliary hypotheses about a designer’s abilities or goals. Is it a signal? An aesthetic exercise? An experiment? It could be any of these, or none. 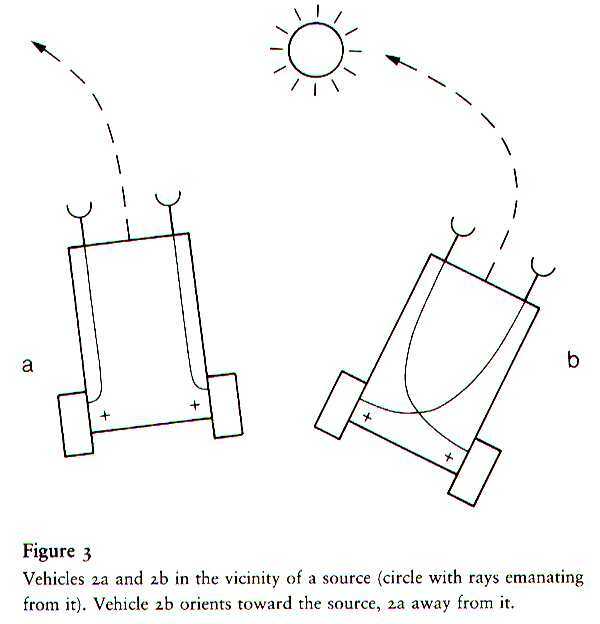 Yet it seems obtuse not to consider design as a plausible explanation of the sunspot’s activity. But if Sober’s objection to the design argument works, then such an inference must be ruled out. For on Sober’s reckoning one must have independent evidence of the designer’s plans and abilities. The second thought experiment suggests that, contra Sober, an inference to a designer could be made from objects which do not strongly resemble objects made by humans; and both thought experiments suggest that design inferences can be made to designers who would not strongly resemble human beings. Indeed, it does not seem that much information about the designer is needed, other than the designer is a rational agent with the power to bring certain events about. Furthermore, Sober demands that very detailed auxiliary hypotheses about the putative designer’s goals and abilities be independently justified (e.g. that the designer would seek to bring about vertebrate eyes with features F1….Fn). This seems to be much too restrictive. All that seems to be required if a design argument to work is a plausible “agent explanation” which makes some event or object likelier than it would be given some purely random process (like the random shuffling of particles)[xxxv]. Accounts of agent explanation seem coherent, intuitively plausible and would seem to entail that explanation by reference to an agent would differ from explanations that cite only events. Certain assumptions about agents are built into the core of an agent explanation. To do an action an agent has to have a reason for acting. A movement brought about by an agent would not be an action unless the agent had a reason for bringing it about…having a reason for an action consists in regarding some states of affairs as a good thing, and the doing of the action as a means to forwarding that state[xxxvi]. As Ratzsch notes: “Agents, nearly by definition, act toward preselected ends, and typically employ instrumental means in the pursuit of those ends”. That an agent is more likely than not to bring about valuable states of affairs arguably is part of the core of an agent explanation, and not an auxiliary hypothesis in need of independent justification. However, suppose it is not part of the core of an agent explanation that an agent is more likely than not to bring about certain values. Sober’s demand for very detailed auxiliary hypotheses citing all the features of the evidence certainly still would not seem necessary. It is sufficient to know that rational agents, often bring about valuable states of affairs by causing complex facts. Following Roger Hambourger[xxxix] a “complex fact” will be defined as a fact that (a) is a conjunction or co-occurrence of numerous states of affairs (b) is very unlikely to have come about unless the states of affairs had a significant part of their causes in common. It is reasonable, then, to search for a cause of a complex fact. And it is part of the definition of a complex fact that it is unlikely to have occurred by purely random processes. According to Hambourger, it can be said that part of the reason certain complex facts are produced by agents is that these complex facts bring about a state of affairs that an agent would value. It seems plausible that certain values supervene on certain complex facts. Roughly, no two identical complex facts could differ in the values they exemplify (or that they fail to exemplify). However the value in question could be exemplified by different complex facts. And it can be said that the value only partly explains why the complex fact exists as, on its own, it is not sufficient to explain the complex fact. An agent’s casual power would also be required for a complete explanation. The value partly explains the complex fact in that it gives an agent a reason to bring the complex fact about. Think about a painting, a cathedral or a novel. Patterns, parts or sentences are arranged into a whole so that some aesthetic or utilitarian purpose can be realised. There is some property about the whole state of affairs, over and above the parts that make up the whole, that would impress an agent, and that would give an agent a reason to bring the whole about. And it is the value that partly explains why the complex fact exists. The beauty of the “Lady with Ermine” is part of the reason that Leonardo da Vinci put various complex coloured patterns on a canvas. The beauty instantiated by the complex pattern gives the designer a reason to bring about the complex pattern[xl]. One may not know exactly what values a designer would have in mind when he uses a sunspot to list the prime numbers. But it is extremely unlikely that such an event would occur by chance; and there are a number of conceivable values that would give an agent a reason to bring this complex fact about (communication or aesthetic beauty). And one merely needs to know that the hypothesis of design makes an event likelier than pure chance for a design argument to have some plausibility. A complex fact need only plausibly realise some valuable state of affairs to raise the likelihood of design over chance. This is certainly the case if these are objectively valuable states of affairs – states of affairs that every rational agent should recognise as valuable. Now perhaps there are other naturalistic explanations for the sunspot’s behaviour. Perhaps these are superior to an “agent explanation”. But Sober’s contention is that non-human design is not preferable to chance as a hypothesis. And that seems to be implausible. As Ratzsch notes: “when a value is produced by a long, tricky, precarious process, when it is generated and preserved by some breathtaking complexity, when it is realised against all odds, then intent – even design – becomes a live and reasonable question”[xli]. In summary, then, certain assumptions about the ends of agents seem to be assumed by agent explanations (agents seek to bring about valuable states of affairs). Furthermore, certain values depend on complex facts. Prima facie, this gives rational agents reasons to bring about such complex facts. So a very detailed auxiliary hypothesis is not required before a design inference can be warranted. For a design argument to work, it is sufficient that a theistic hypothesis is not totally uninformative about the probability of the evidence. All that is needed is either an auxiliary hypothesis or some other reason to think that agents often create valuable states of affairs by creating complex facts. It would be useful if Sober’s demand for an auxiliary hypothesis could be met. Furthermore, it would be good if this auxiliary hypothesis could be met without relying on data gathered from human agents. Sober’s demand for an auxiliary hypothesis supported by independent evidence can be answered in the following way. There are certain auxiliary hypotheses that follow directly from the concepts used by the core hypotheses. For example, suppose a negatively charged particle is hypothesised to explain some observation and a positively charged particle to explain some other observation. Independent evidence is not required to know that these two hypothetical particles would attract each other if they came into a certain degree of proximity. This does not follow from independent evidence, but rather from the concepts of negatively and positively charged particles. Similarly, if an omniscient, omnipotent and free agent is hypothesised and there is also good reason to believe in objective values then certain justified predictions about what God is more likely to create can be made. Now God, by hypothesis, counts as a rational agent having knowledge, power and freedom. Indeed, having unlimited knowledge, power and freedom, God would be the perfect rational agent. If God acts he acts for reasons; so God can be the agent in an agent explanation. Can it be known prior to any consideration of the evidence what reasons God would have for acting? Well, God would act to bring about states of affairs that God would value. Can it be known prior to any consideration of the evidence what God would value? That is, does anything interesting or informative follow from the concept of God with respect to the type of auxiliary hypotheses demanded by Sober? Being omniscient, free and omnipotent God would know, desire and be able to bring about objectively valuable states of affairs. Richard Swinburne[xlii] argues that God’s omniscience guarantees that God would know what is good and his omnipotence and freedom guarantee that there is no external constraint that would prevent God from choosing what is good. [xliii] Whilst our understanding of what is objectively valuable may be limited, it seems unduly sceptical to say humans cannot make any reliable judgments about what is truly valuable. A complete moral scepticism would follow. So it is reasonable to believe that there are states of affairs that both humans and God would regard as valuable. [xliv] The broader the value is construed (beauty or consciousness – as opposed to vertebrate eyes or neural networks) the more likely it is a value that God also recognises. Certain objectively valuable states of affairs (for example, certain types of beauty, life in general, or human beings in particular) depend on complex facts. So God would have some reason to bring those complex facts about because God would desire the objectively valuable states that they realise. It has already been argued that Sober’s demand for a detailed auxiliary hypothesis predicting that God would desire to create the vertebrate eye with its precise structure is excessive. However, this auxiliary hypothesis seems to follow from the conjunction of the two core hypotheses of theism and the objectivity of values: God would be motivated to bring about complex facts when those facts realise objectively valuable states of affairs. To illustrate, consider Swinburne’s response to an argument by D.H Mellor (Mellor’s argument is remarkably similar to Sober’s[xlv]). Imagine finding the cards in a bridge hand dealt in a certain order. One can only tell if a cheat has put them in this order (as opposed to shuffling) if it is known in advance of finding the cards in what order a cheat is likely to have put them. This would involve knowing in advance what a valuable hand of bridge looks like. Mellor then argues that what God values cannot be known by humans and that therefore what God would bring about cannot be known either. Therefore one cannot tell if the world has been designed or not. Swinburne, however, argues that it is known, a priori, what God would want to create. Swinburne argues that God is much more likely to create a world with conscious, free, embodied beings, as worlds with conscious free and embodied beings have greater value than those that do not. Swinburne’s case seems persuasive, but a more modest claim need only be defended to meet Mellor and Sober’s challenge. This seems to follow directly when hypothesis of theism is conjoined with the hypothesis of objective moral values. In the absence of an argument for moral scepticism, it is probable that humans would recognise some of the values that God recognises. God having maximal knowledge would know these values. God having maximal freedom (no external constraints on his will) would wish to bring about these values. And some types of value require intricately ordered – that is to say complex –states of affairs. God having maximal power is more than able to bring about these complex states of affairs and the supervening values. So it seems that there is a justified auxiliary hypothesis that “God is likely to bring about complex facts that realise valuable states of affairs”. Another response to Sober has been suggested by Lydia McGrew[xlvi] who has argued in “Testability, Likelihoods, and Design”[xlvii] that we do not need to justify auxiliary hypotheses about a putative designer’s goals and abilities. Frequencies from known agents can supply the likelihood of design. McGrew does not seek a precise value of how improbable an irreducibly complex system is on naturalistic assumptions. Rather “irreducible complexity” is one property that allows us to group certain objects together as “machines”. Rational agents produce machines with some frequency. This frequency data enables us to get a grip on the comparative likelihoods of machines given a designer and machines given chance. McGrew asks us to consider a scenario to illustrate her point. Imagine that in the future we take pictures of a Volkswagen Beetle orbiting a planet in the Alpha Centauri region. It would be clear that humans are not the designers as no human has ever travelled to that region. Furthermore there is no knowledge of the Volkswagen’s designer’s goals in putting an automobile into orbit. McGrew’s appeal to the discovery of “machines” in nature will be returned to in the next section. It is her inference from frequency data about humans to the probable actions of a divine agent which is now being considered. And, as a whole, humans have not frequently made machines throughout their history. Comparatively few humans are in the machine making business today; and the early history of our species does not involve much by way of engineering. So rather than considering the likelihood of “machines” given theism, we will merely examine the likelihood of God making “complex wholes, composed of numerous parts”. Now, bridging the gap between frequency data and reasonable degrees of belief is a controversial matter. The major problem, of course, is finding an appropriate reference class of events with which to judge the frequencies of outcomes. When assigning a probability to (say) an outcome of an event, we should consider that event as a member of a class of similar events. It can then be asked in what proportion of the events in this class was there an outcome of the type we are interested in? For example, we might be interested in the probability of the particular outcome of “passing exams”. This could be considered an outcome of the class of events “attending a revision session”. The more often “attending a revision session” has had the outcome “passing exams”, the greater the probability this pattern will be repeated. The more times a particular outcome has followed events similar to the event under consideration, the more likely it is to happen again in the case under consideration. A major problem, though, is finding the appropriate class of events (or processes or whatever) with which to judge the frequencies of outcomes. [liv] Suppose a political prisoner has escaped a death sentence by firing squad because the firing squad repeatedly missed their target. The prisoner wishes to know whether she was very lucky or whether the firing squad refused to execute her. So she examines whether or not firing squads frequently miss their target. Which reference class should be used to assign a probability to the firing squad missing her? Should she examine every “target” aimed at by firing squads or just “human targets”? Should she be more specific, and consider “prisoners” rather than “human targets”? Or “political prisoners”? Or “female political prisoners”? Should she examine the performance “firing squads” as a class? Or should she be more restrictive – “appropriately trained, equipped and well paid firing squads”? For instance, suppose I am trying to decide whether to take up hang-gliding or lawn bowls, I want to know which is more dangerous, so I determine how many people from each sport have died. It turns out that a greater proportion of those who play lawn bowls have died each year than of those who do hang-gliding. It is more probable, I conclude, that I will die if I take up lawn bowls than if I take up hang-gliding. Now, before Sober is prepared to allow an inference to a divine designer he requires information about the sorts of things that God would be likely to create. In effect, he argues that because we have no independent information about the class of “non-human agents” , and because God is a non-human agent, we cannot make a judgment about what God is likely to create. But why should we think that “non-human rational agents” is the relevant reference class? Why can God not be simply counted as a member of the class of all “rational agents”? If God is a rational agent, and humans are rational agents, then we may have enough data to infer what God is likely to create. After all, the causally relevant features of any designer would be the freedom and knowledge to form a plan, and the causal power to put that plan into effect. God would have those features. It certainly seems reasonableto believe that data gathered from human agents is applicable to non-human agents when making inferences about design, even when we lack knowledge of the non-human agents’ precise goals and abilities. Whatever else humans are, it is surely reasonable to believe that they are rational agents. And it also seems perfectly conceivable that rational agency could be a property of non-human systems. Humans frequently create complex wholes composed of numerous parts. So there is a degree of reasonable belief grounded in frequency data that a rational agent is more likely than a purely random process to produce complex wholes composed of numerous parts: and God is a rational agent. Why Would God be in the Watchmaking Business? It has been argued that conceptual considerations about God and objective values justify an auxiliary hypothesis that God would be likely to bring about complex facts which realise objectively valuable states of affairs. It has also been argued that God should be classed as a rational agent; therefore, from our frequency data, we can conclude that God is more likely than a purely random process to produce complex wholes from numerous parts. There is much about the universe that a powerful, knowledgeable and good God would plausibly value. Life and much natural beauty depend on certain complex physical, chemical and biochemical facts. Consciousness and altruism (as embodied agents experience them) depend on complex nervous systems. If complex facts, directly or indirectly, plausibly bring about objectively good states of affairs we should prefer design to pure chance as a more likely explanation; and the greater the complexity of the fact the less probable it resulted from chance. The only knowledge that we need of God’s goals is that God will seek to bring about objectively valuable states of affairs. Can more be said? It has been noted above that McGrew argues that the design argument in biology should be based on the proposition that we have discovered complex biological machines. Machines certainly count as complex wholes composed of numerous parts. Del Ratzsch similarly argues that “active functionality and maintenance of high degrees of stable complexity intuitively suggest design.”[lvii] Is this a case of anthropomorphic reasoning? Is there a relevant difference between human and divine designers which should lead us to reject biological “machines” as evidence of design? Reflect on the purposes that machines serve. Machines typically serve utilitarian purposes. Machines have fixed and moving parts that modify mechanical energy and transmit it in a more useful form. Humans need machines because they need devices that make efficient use of energy. For humans, resources are scarce. So we can expect to find human or human like creatures as a cause of machines. Can we say the same of divine designers? It is difficult to conceive of a divine designer that struggles with a lack of resources. Traditionally theists have construed God as being able to create new resources ex nihilo. It might seem unlikely that God would need or want machines. However, the “biological machines” that McGrew draws attention to could indirectly bring about a state of affairs that the designer would value. For example, Richard Swinburne argues that God would value animal life and embodied agents[lviii]. Embodied agents and animals need certain types of body. We may go on from Swinburne to imagine if God wishes to actualise these animals and agents then he may need to give them bodies that work efficiently. So these bodies may well resemble machines in some ways. It is also possible that McGrew’s “machines with the property of irreducible complexity” could directly bring about a state of affairs that the designer would value. Beauty, conceivably, is an objectively good state of affairs. Perhaps it could be argued that the intricate order of living creatures exemplify beauty, or some other objectively valuable aesthetic value. [lix] Design seems more likely than chance to produce “machines” with the property of irreducible complexity. In any case, there seems to be no relevant difference between human and divine designers which would rule machine-like objects as evidence of divine design. However, suppose no plausible value or goal could be discerned for a machine. 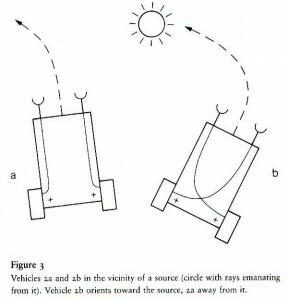 Consider Dan Lloyd’s “Cross Eyed Squint”[lx], a Braitenberg-type vehicle which has a wheel, a power source, two receptor transducers and an AND gate. If both receptor transducers receive light, they convert it into electrical impulses which travel along channels to the AND gate. The AND gate changes state transmitting a signal which drives the wheel. The result is that the “Cross Eyed Squint” moves towards light sources. “Squint” serves no obvious practical purpose (outside thought experiments about intentionality). “Squint” can do nothing with the light, and it can send no information about the light, and the light does not benefit “Squint” in any way. Yet if a microscopic “Squint” machine were to be discovered, that could not reproduce and simply moved toward light sources until they ran out of power, we would still be inclined to infer a designer. Del Ratzch argues that it need not merely be functionality which triggers a design inference. The observation of numerous parts working together in an arrangement which is highly unlikely to have occurred by chance suggests that some goal is being pursued. Machines seem “intent relevant”[lxi]; they provide evidence (perhaps substantial evidence) of purpose. A complex arrangement of parts suggests that some goal is being pursued. It should also be noted that the goals of human beings – even our own – are rarely transparent. Since Freud and Darwin, it has been commonplace for theorists to argue that our goals are not obvious, even to ourselves. Consider works of art. We may participate in art merely for the sake of self-expression. Or we may use art to express some repressed desire. Or art may be founded on social utility or mate selection. Different theorists detect different goals in our actions. This casts doubt on the idea that we need knowledge of an designer’s goals before a design hypothesis can have any predictive power, for we often lack precise knowledge of human designer’s goals even after human design has been confirmed. Sober provides one argument that there is a relevant difference between the divine mind and the minds of human designers, which would rule out inferences from human agents to the sort of creative activity that God would engage in. He believes that if the theist is to effectively respond to the evidential problem of evil then the theist must posit a gap between the designer’s minds and ours. The evidential problem of evil can be set out in this way. For the evil we observe in the universe to favour atheism over the hypothesis that a “Powerful, Knowledgeable and Good (PKG) God exists”, a likelihood inequality would have to be true: Pr( e |there is no God) > Pr ( e |an all PKG God exists) where in the inequality E is a detailed description of all the evils that exist. Now, arguably, a good, omnipotent and omniscient creator would eliminate every evil which is not necessary to bring about some greater good. But consider all the murders, rapes, massacres and other atrocities in our world. Is it really conceivable that each of these instances of suffering was necessary to bring about some greater good? So the evil described in E might provide very powerful evidence that God does not exist. Sober notes that Steve Wykstra proposes an effective response to the evidential problems of evil: that humans have limitations that might prevent them from knowing greater goods that God is aware of. Wykstra challenges this assumption. Although we cannot detect any good that would be brought about by certain instances of intense suffering, we cannot infer that there are none. God might have knowledge of values which we cannot detect. If God’s thoughts are higher than our thoughts, and God’s ways are sufficiently mysterious, we cannot predict what sort of world a good God would create. But Sober argues that this supports his criticism of the design argument: we cannot predict what God would create. However, to meet the challenge of the evidential problem of evil Wykstra need not argue that all of God’s goals and values are mysterious and beyond the ken of human beings. Wykstra need only argue that it is possible that God has knowledge of some greater good that we are unaware of; and that this might justify seemingly gratuitous evils. But God could still share many values with human beings and have many goals that humans could comprehend; in which case, we could detect evidence of God’s purposiveness in nature. It is also worth noting that Sober’s position seems to have changed somewhat. In Evidence and Evolution he points out that the likelihood formulation shows that we can have considerable uncertainty about God’s motives in allowing certain types of evil: “The question is whether E’s probability increases if there is no God”. [lxiv] He now suggests that the design argument requires more knowledge of the creator’s goals than the evidential problem of evil does. But the evidential problem of evil presupposes that we could recognise states of the universe that God would not be likely to value. And unless one wishes to concede that no amount of suffering could count against God’s existence, it should be agreed with Sober that the problem of evil could have at least some evidential force. So if we accept that evil could represent evidence against theism, then we should also accept that there could be features of the universe that would provide evidence for theism. But then it seems reasonable that there could be states of the universe that we could recognise as giving an agent reason to bring them about. For example – a universe that contains living conscious self -aware creatures would be more valuable than one that did not. Complex facts about the universe, which are highly unlikely to come about by chance, make certain valuable states of affairs possible. This is sufficient to motivate and ground a design argument. Sober complains that the design argument asks us to imagine a designer who is radically different from the human craftsmen we know about. But if this designer is so different, Sober wonders, why are we so sure that this being would build the vertebrate eye in the form in which we find it? The answer is that God might be unlike humans in many respects; however, he is like humans in that he is a rational agent. God has knowledge and creative power; so God shares features with humans which are causally relevant for design inferences. If values are objective, and humans have knowledge of objective values, then God would share at least some values with humans, and likely seek to bring these about. These values would arguably include beauty, life, consciousness and community. It is not that God could be expected to make the vertebrate eye with its specific features. Rather, theism predicts that God is likelier than a purely random process to create ordered, complex states of affairs which bring about some objective value. The vertebrate eye is a delicate thing of beauty in its own right; it also brings about sight. It is highly unlikely to have come about by pure chance. So theism is a better explanation than chance for the vertebrate eye. Furthermore, it seems to be part of the definition of a rational agent that a rational agent acts for certain ends. The observation of a complex arrangement of parts suggests that some goal is being pursued if this arrangement is highly unlikely to have occurred by chance. And if an observation of a complex arrangement of parts seems highly suggestive of intentionality, then a complex arrangement of events is also suggestive of intent. The laws of nature, including evolution by natural selection, would also be suggestive of design. So scientific discoveries might not explain design away; they might confirm it. Block, N. “Troubles with functionalism”. Minnesota Studies in The Philosophy of Science 9 (1966) 261–325. Collins, R. “The Teleological Argument: An Exploration of the Fine-Tuning of the Universe.” in Moreland and Craig ed. The Blackwell Companion to Natural Theology. Malden:Wiley-Blackwell, 2009. Collins,R. “Hume, Fine-Tuning and the ‘Who Designed God?’ Objection.” in In Defense of Natural Theology: A Post-Humean Assessment. ed. James F. Sennett and Douglas Groothuis. Illinois: InterVarsity Press, 2005. Conway-Morris, S. Life’s Solution: Inevitable Humans in a Lonely Universe New York: Cambridge University Press, 2003. Davies, B. An Introduction to the Philosophy of Religion .Oxford: Oxford University Press, 2004. Dawkins, R. The Blind Watchmaker. London: Penguin, 1986. Dawkins R. Climbing Mount Improbable. New York: Norton, 1996. Dawkins R.. The God Delusion. London: Bantam, 2006. Dawkins. R. The Selfish Gene. New York: Oxford University Press, 1989. Dougherty, T. and Gage, L. “New Atheist Approaches to Religion.” in The Routledge Handbook of Contemporary Philosophy of Religion . ed. Graham Oppy. New York: Routledge, 2015. Ganssle, G. “Dawkins’s Best Argument: The Case Against God in The God Delusion.” Philosophia Christi 10 (2008): 39-56. Glass,D. “Probability and the Presumption of Atheism.” Yearbook of the Irish Philosophical Society (2010): 58-68. Glass, D. “Can evidence for design be explained away?” in Probability in the Philosophy of Religion. edited by Chandler. J. and Harrison. V. Oxford: Oxford University Press, (2012) 77-102. Glass, D. “Design, Darwin and Dawkins’ Dilemma.” Sophia 51 (2012): 31-57. Idziak , J. “Divine Commands are the Foundation of Morality” ed. Peterson and Vanarragon in Contemporary Debates in the Philosophy of Religion. Oxford: Blackwell, 2005. Jaquette, D. The Philosophy of Mind . London: Continuum Press, 2009. Leftow Brian “The Ontological Argument.” in The Oxford Handbook of Philosophy of Religion . ed.. Wainwright,W. New York: Oxford University Press, 2005. Lowe EJ , An Introduction to the Philosophy of Mind Cambridge: Cambridge University Press, 2000. Lowe, EJ. Metaphysics. Oxford: Oxford University Press, 2002. Mann, W. E. “Divine Sovereignty and Aseity” in The Oxford Handbook of Philosophy of Religion ed. Wainwright, W .Oxford:Oxford University Press, 2005. Meyer, S. The Signature in the Cell. New York: HarperOne, 2010. McGrew, L. ” “Historical Inquiry.” In The Routledge Companion to Theism. ed. Victoria Harrison. Stewart Goetz. and Charles Taliaferro. New York: Routledge. 2013, 281-293. McGrew, L. “Testability. Likelihoods. and Design.” Philo 7:1 (2004): 5-21. Montague, R. “Dawkins’ Infinite Regress” Philosophy 83:323 (2008): 113-115. Moreland JP Soul .Illinois: IVP, 2013. Moreland, JP and Craig, W. Philosophical Foundations for a Christian Worldview Illinois:IVP,2003. Oppy, G. Arguing About God .Cambridge: Cambridge University Press, 2006. Plantinga, A. Where the Conflict Really Lies .New York: Oxford University Press, 2011. Plantinga, A. “The Dawkins Confusion” Books and Culture http://www.booksandculture.com/articles/2007/marapr/1.21.html (retrieved 07/04/15). Pruss, A. “Ex Nihilo Nihil Fit: Arguments new and old for the Principle of Sufficient Reason”. in: J. Campbell. M. O’Rourke and H. Silverstein (eds.). Causation and Explanation. Massachusetts: MIT Press, 2007. Ratzch, D. Nature. Design and Science: The Status of Design in Natural Science Albany: State University of New York Press, 2001. Richmond, P. “Richard Dawkins’ Darwinian Objection to Unexplained Complexity in God” Science and Christian Belief. 19:2 (2007): 99-116. Searle, J. “Minds, Brains. and Programs.” Behavioral and Brain Sciences 3, (1980): 417-424. Searle, J. “Is the Brain’s Mind a Computer Program?”. Scientific American. 262 (1990): 26–31. Sober, E. “The Design Argument: An updated version of an article in “The Blackwell Companion to the Philosophy of Religion”(W Mann ed) 2005” . available at http://philosophy.wisc.edu/sober/design%20argument%2011%202004.pdf (retrieved 07/04/15). Sober, E. “Intelligent Design and the Supernatural: the ‘God or Extra-terrestrials Reply” Faith and Philosophy (2007): 72-82. Sober, E.“What is wrong with Intelligent Design” Quarterly Review of Biology 82:1 (2007): 3-8. Sober, E. Evidence and Evolution. Cambridge: Cambridge University Press, 2008. Strickland, L. “The ‘who designed the designer’ objection to design arguments” International Journal of the Philosophy of Religion (2014): 87-100. Swinburne, R. The Existence of God. Oxford University Press: Oxford, 2004. Swinburne, R. “A Simple Theism for a Mixed World”. Religious Studies 43 (2007): 271-77. Swinburne, R. “How the divine properties fit together: Reply to Gwiazda”, Religious Studies, 45, (2009): 495-8. Swinburne, R. “God as the Simplest Explanation of the Universe”. in, Philosophy and Religion. ed. A.O’Hear. Royal Institute of Philosophy Supplement 68, 2011. Swinburne, R. Mind. Brain and Free Will Oxford: Oxford University Press, 2013. Swinburne, R. The Existence of God Oxford: Oxford University Press, 2004. Taliaferro, C. and Evans, J. The Image in Mind .New York: Bloomsbury, 2013. Taliaferro, C. Evidence and Faith: Philosophy and Religion Since the Seventeenth Century New York: Cambridge University Press, 2005. Van Inwagen, P. Metaphysics .Westview Press, 2008. White, R. “Miracles and Rational Belief” in ed. Kirsten Birkett The Myths of Science Kingsford: Matthias Media, 2003, 60-66. Wielenberg, E. “Dawkins’ Gambit. Hume’s Aroma and God’s Simplicty”. Philosophia Christi.11 (2009):113-128. Ward, K. God. Chance and Necessity London: Oneworld Publications, 1996. Ward, K.Why There Almost Certainly Is a God. Oxford: Lion, 2008. [i] For example: Rodney Holder, God, the Multiverse, and Everything, (Aldershot: Ashgate, 2004); Rodney Holder, Big Bang, Big God, (Oxford: Lion, 2013); Robin Collins, “The Teleological Argument: An Exploration of the Fine-Tuning of the Universe”, in Moreland and Craig ed. The Blackwell Companion to Natural Theology, (Wiley-Blackwell:Malden, 2009); Swinburne, R. The Existence of God, (Oxford University Press:Oxford, 2004), 172-191. [iv] Alvin Plantinga Where the Conflict Really Lies (New York: Oxford University Press, 2011), 219-224. [xi] David Hume, Dialogues Concerning Natural Religion, ed. Albert and Lisolette Anderson (Millis: Agora, 2004), 28. [xiii] Sober, “The Design Argument”,8. 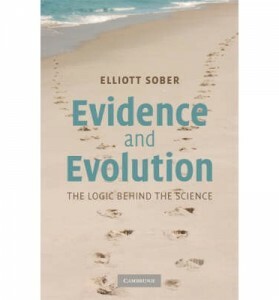 [xix] Elliott Sober, Evidence and Evolution, (Cambridge: Cambridge University Press: 2008) , 122. [xxxi] However, these thought experiments might not be quite as bizarre as they seem at first glance. Scientists have often speculated if life could exist on environments radically unlike Earth’s; for example, F. Drake’s famous article “Life on a Neutron Star,” Astronomy, p. 5, (December 1973). A less whimsical discussion of the possibility of exotic forms of life, including life on interstellar clouds, can be found it Simon Conway Morris’s Life’s Solution: Inevitable Humans in a Lonely Universe (New York: Cambridge University Press, 2003) , 24 -33. For a discussion of the possibility of non- biological intelligence see Paul Davies The Eerie Silence (London, Penguin, 2011), 153-169. Astrophysicist and theologian David Wilkinson admits that life based on plasma or exotic matter might be possible (although he deems the idea highly speculative and it is very, very unlikely that such beings exist); see David Wilkinson Alone in the Universe (Cape Town: Monarch,1997) , 61. [xxxii] For a defence of the importance of thought experiments and imagination to philosophy see Charles Taliaferro and Jil Evans, The Image in Mind (New York :Bloomsbury, 2013); and Charles Taliaferro Evidence and Faith: Philosophy and Religion Since the Seventeenth Century (New York: Cambridge University Press, 2005) ,66, 87-91. [xlii] In “Simple Theism” Swinburne argues that because God is omniscient and because God does not suffer from akrasia, God is essentially good. His desire to perform a certain action is proportional to the believed goodness of the reasons for that action. Since God’s beliefs are true, God will do what is good. He would not choose some other “overriding reason” not to perform a good action, as he is not subject to non-rational forces. [xlvi] Stephen Meyer relies heavily on frequency data to infer Design as the Best Explanation in The Signature in the Cell. This entry was posted in Existence of God, Selected Articles. Bookmark the permalink.